(CN) – Record heat combined with dry conditions paved the way for several new wildfires across California over the weekend, as firefighters continue to grapple with an early and active fire season. The Klamathon Fire, along the California-Oregon border, turned deadly over as a woman was killed in her home in the rapidly spreading fire. The blaze grew to over 35,000 acres with containment listed at 35 percent on Monday morning. Three firefighters were injured fighting the blaze, which sparked in the Klamath National Forest and jumped the Oregon border overnight Sunday into Monday. The fire has already consumed about 70 structures and spurred several evacuation orders in both California and southern Oregon. Evacuation orders are in effect around the Irongate Reservoir and in the communities of Hornbrook, Hilt and Colestin. “From Pilot Rock following a diagonal line back to the California-Oregon border, that’s where there are some challenges – steep terrain, lots of heavy vegetation as well as some direct and indirect fireline,” said Melissa Cano with the Oregon Department of Forestry. The Klamath River has generally contained the fire’s spread south, but the northern and western flanks will continue to be active on Monday, according to Cal Fire. The agency is combining resources with the Oregon Department of Forestry and federal firefighting forces from the Bureau of Land Management and the U.S. Forest Service. While the most costly in terms of lives and economic destruction, the Klamathon Fire is not the only large fire to break out during a weekend where temperatures soared across California and much of the American West. In Southern California, where temperature records were shattered throughout the region, the Holiday Fire started late Friday and spread throughout the weekend in an area of Santa Barbara County. The region was scorched in December by the Thomas Fire, California’s largest fire by acreage in recorded history. The fire burning near the beach town of Goleta destroyed about 20 structures, but firefighters have made progress with containment listed at 90 percent on Monday. Several other spot fires listed at 3,000 acres or less sparked all over the state. The Georges Fire, which has burned about 2,000 acres in the Alabama Hills near Lone Pine on the eastern side of the Sierra, means hikers who planned to summit Mt. Whitney will have to abandon or delay their plans for the highest point in the lower 48. Firefighters also continued working to contain some the state’s largest conflagrations, some of which date back to late June. The largest fire of the season, the County Fire, is burning east of Lake Berryessa in Napa and Yolo counties. At 90,000 acres, the fire is 70 percent contained with firefighting concentrated on stemming its movement northwards. “Crews continue to mop up and improve line in the most northern part of the fire,” said Israel Pinzon, Cal Fire spokesman, on Monday. 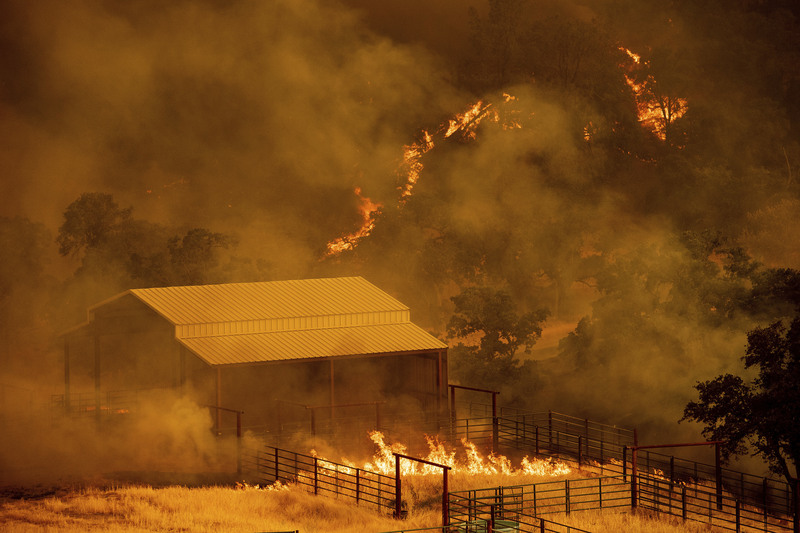 The fire, which began on June 30, has consumed 16 structures and forced the evacuations of hundreds of people, particularly in the Yolo/Lake County Line area. The worst of the heat that has gripped the Golden State has passed, though hot temperatures will persist through the beginning of the week. Cal Fire and other agencies say the wind speed and direction will be the largest factor in keeping the wildland fires subdued.